When released from prison, an ex-offender has no money, no prospective job and sometimes no family to turn to. Many ex-offenders are statistically proven either to become homeless or to go back into the state penitentiary system. However, some individuals are able to overcome these barriers and begin a new life. One such person is Ozzie*. Ozzie was an inmate for many years in Texas and did not hear the Gospel until the Philippi Prison Ministry, a ministry of Texas Baptists Missions, visited his ward. After hearing the Gospel, Ozzie joined a Philippi Prisoner Fellowship Group and began studying God’s word and meeting with fellow Christian prisoners. After Ozzie was transferred to another ward, he began a Philippi Prisoner Fellowship Group of his own and continually shared the Gospel with fellow inmates. He led other prisoners to faith and, in turn, invited them to the Bible study group. Upon Ozzie’s release from prison, he began work as a welder and led his family to Christ. He continues to teach and lead small groups as a multi-house church planter. By giving through the Cooperative Program, our church helps make it possible for prisoners to receive Bibles, devotionals and Bible dictionaries. 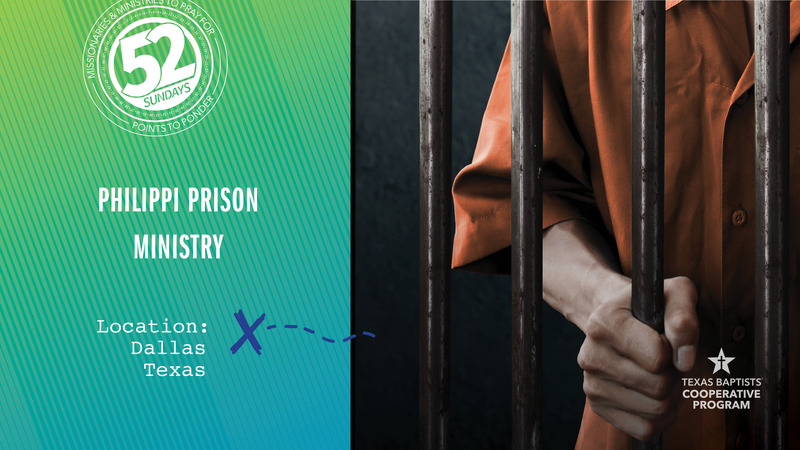 Let’s pray for the Philippi Prison Ministry and the Texas Baptists Multi-Housing and House Congregations Ministry to continue in radically changing lives.